The SV700 Series has been discontinued. Please contact our Flow Engineering Department for possible alternatives. SV-700 Series diaphragm valves are designed for use in plastic systems in sizes from 15 to 50 mm ( 1 /2 to 2"). The 2-way PVC or PVDF body and seal combination allows for the handling of ultra-pure, aggressive, viscous, or abrasive fluids. The valve bodies are available with PVC/PVDF connections for radial assembly, with threaded, solvent, or fusion joint end connectors. It’s glandless design make this valve ideal for water treatment, reverse osmosis, ion exchange systems or ultra-pure process plant applications. 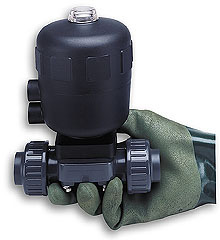 Remote control with the use of explosion-resistant pilot solenoid valves allows use in hazardous areas. The valves are operated by connecting an external pilot fluid to the piston actuator. The diaphragm between the actuator and the body isolates the fluid from the actuator. The valves are maintenance free, and can be fitted with accessories for position indication or stroke limitation. The actuators provide long service life, low control air consumption, and are available in various sizes. The convenient location of the pilot-air connection and the unit’s compact dimensions allow space-saving side-by-side installation. The pilot port has stainless steel inserts; 3-way pilot solenoid valves can be directly mounted. Spring pressure is relieved when dismantling, which provides safety when you have to remove the cover to change the circuit function or install options. The glandless valves are resistant to aggressive fluids, and the internal shape of the body is designed for high flow and resistance to contaminated and abrasive fluids. Flow direction and installation can be adjusted as the application requires. A high-quality diaphragm isolates the body from the actuator and provides the total external and internal seal integrity. The valves have no dead volume and can be installed for self-draining. Please download PDF below for complete product specifications and available products.